Adopt a Kitty! Empty Cages Event This Weekend. Hey, New York City! You should come to Williamsburg this Saturday and adopt a cat. 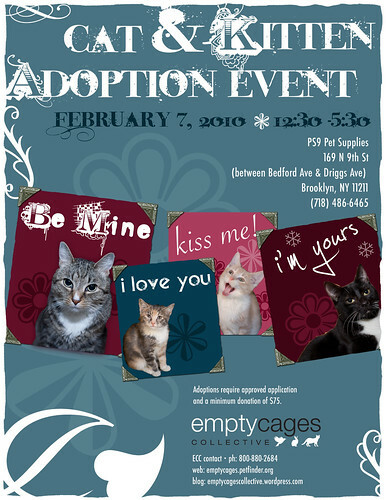 Empty Cages Collective is holding an adoption event. It will be held at PS 9 Pets on North 9TH Street. Please? Pretty please? ECC is a no-kill shelter. They work to trap, neuter and spay Brooklyn’s feral kitties (among other things). But sometimes, the cats aren’t actually feral and so they take them in and those guys need homes. Need a little love in your life? Adopt a kitty! Wanna give a little love?Maybe you’d like to make a donation? In related news: Matt is a 9-year-old tiger kitty who is set to be killed tomorrow at another shelter. Let’s try and save him. Previous Post My Due Date. Next Post Mom It Down: Vanilla Cake with Chocolate Frosting.